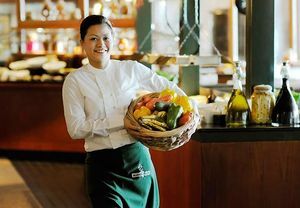 DUBAI, UNITED ARAB EMIRATES--(Marketwired - May 13, 2014) - Experience Ramadan at one of the premier luxury hotels in Dubai, and break your fast with flavoursome Iftar and Sohour selections prepared daily by the skilled culinary staff of the JW Marriott Hotel Dubai. Located next to the popular Hamarain Shopping Center in the city's downtown, this highly recognized event venue in Dubai has planned special food and beverage features for Iftars and Sohours with unique surroundings and spectacular ambience so families and friends can get together during this time of reflection and spiritual devotion. Indulge this Ramadan with a flavoursome Iftar buffet provided by The Market Place featuring live cooking stations, authentic Arabic dishes, sweets and traditional Ramadan beverages. The Market Place, styled as a traditional Dubai market featuring a host of international flavours, is open every night of Ramadan and with a price of AED 165 per person and AED 60 for children aged 6 to 12, its one of the best Dubai hotel deals in the city! Helping to make this Ramadan one to remember for a lifetime, the JW Marriott Hotel Dubai is also planning a pre-dawn feast that's sure to prepare anyone for a day of blessed fasting and spiritual cleansing. Perfect for Sohour, the hotel's quiet and stylish 24-hour Viennese coffee shop, the Vienna Café, is serving a superb Sohour menu daily from 2 to 4 a.m. during Ramadan. Featuring all the traditional Sohour fare, this special menu is priced at AED 90 per person and AED 60 for children aged 6 to 12. The delightful venue is located in the hotel's main lobby and also features complimentary Wi-Fi. For additional information, or to book a reservation, please contact the JW Marriott Hotel Dubai at +971 4 607 7977 or online at www.marriottdiningatjw.ae. The JW Marriott Hotel Dubai is one of the city's finest 5-star hotels providing guests with a lavish and remarkable experience. Conveniently situated near the Dubai International Airport, this stylish lodging is nestled within the business district and near the popular Dubai Museum. The lavish hotel sports 10 world-class restaurants and bars, award winning event space, a rooftop pool, health club and squash court all befitting Dubai's role as an international business centre and tourist destination. Well suited for both business guests and leisure travellers, guest accommodations include wireless high-speed Internet, complimentary on-site parking or valet parking and a staffed on-site business centre. At the JW Marriott Hotel Dubai, the traditional wonders of Dubai are just around the corner. A visit to the nearby Dubai Gold, Spice and Textile Souks will excite the senses and Burj Khalifa, the world's tallest building, offers spectacular views of the downtown Dubai skyline and beyond from its panoramic observation deck. Celebrate Ramadan and break your fast at JW Marriott Hotel Dubai, a luxury hotel offering bountiful buffets of Arabic dishes and beverages.